Inter Milan president Erick Thohir has assured coach Walter Mazzarri that his job is safe. Inter are fifth in Serie A but only four points ahead of 10th-placed Lazio, who they face on Saturday. 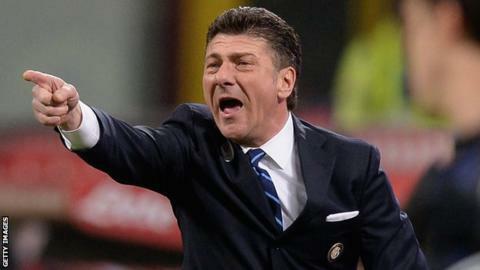 Some Inter fans are unhappy with Mazzarri and called for him to be sacked after the 1-0 defeat by fierce rivals AC Milan on 4 May. But Thohir said: "Mazzarri is staying. He still has a contract and I want to respect that." Italian Mazzarri has been in charge at Inter since May 2013, with Indonesian businessman Thohir assuming control of the club five months later. Thohir said: "I understand the fans. I'm not happy either but we need to give the manager a chance. It's important that we start next season with some stability in order to grow." Saturday's match against Lazio will be defender Javier Zanetti's last outing as a player at the San Siro after 19 years with Inter. The 40-year-old is due to take up an unspecified role within the club next season.